Card Text Play: Swap your deck and your discard pile. Then, shuffle your deck. 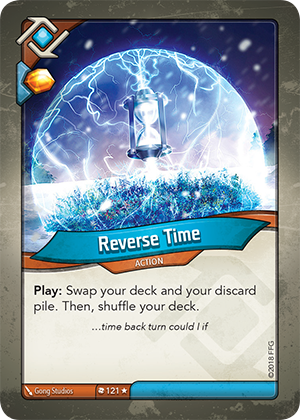 Does Reverse Time enter my discard pile before or after I swap my deck and discard pile? After. Action cards do not enter the discard pile until they have fully resolved. Therefore, Reverse Time wouldn’t enter the discard pile until after it is swapped with the deck.